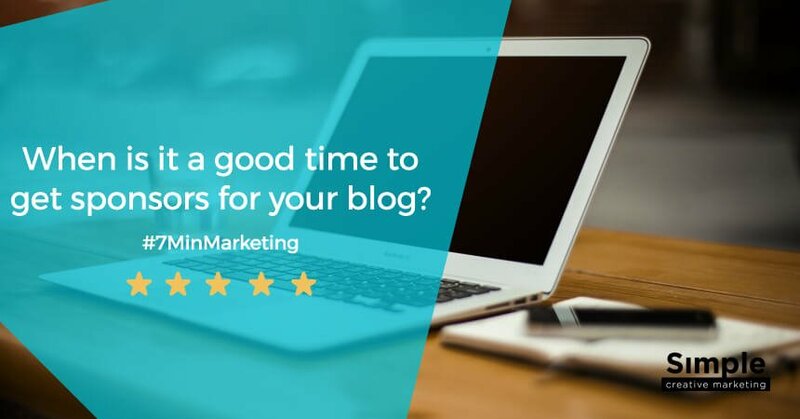 Blog sponsorship: When is it a good time to get sponsors for your blog? Wondering when is the ideal time to seek blog sponsorship and get paid to promote other people’s products or services on your website? Today we answer this. When is good time to start asking people if they're willing to pay to get their products or services advertised on your website or your blog? And this question really comes from Deb who's part of our Momentum Warriors Community, and Deb has this idea of creating some kind of blogs or website where she features local creatives in the community, and she'll do interviews and profile them, and in order for them to be profiled, they pay her some kind of fee to be listed on her website, and then, the benefit to them is they're gonna get some exposure to ideally their target audience or people who might buy their artwork or engage them for services or whatnot. So my answer to this question is around, well, first of all, if you're gonna sell something to someone, you need to really understand what it is that you're selling and whether or not they want to buy that, okay? So you need to understand what's important to them. If they want to be featured on your website, you're gonna need to be able to prove to them and demonstrate to them that you can deliver on the promise that they're gonna get some kind of visibility. So how are you gonna measure that? Does that mean they're gonna get a certain number of clicks on links that go back to their website or products or services that they're selling and featuring on your website, or does it mean that they exposure to media channels or some other kind of, through your newsletter or through your social media channels or something like that? And you're gonna need to quantify all this because if people are paying money, they want to understand what's the return on investment of that money, okay? So if you're just starting out, what I would suggest is, and this is based on some research I did around blogging communities that I'm part of, and a couple of people have suggested that you might want to build some monthly traffic on your website, something around 2,000 visitors, unique visitors per month. And then you can demonstrate through analytics and whatnot that your website is actually getting that kind of volume every month. You need to demonstrate that it's targeted traffic and that people are reading and visiting your website. If you don't have those numbers and you can't demonstrate that to your potential buyer, then it's very hard to convince them that they're gonna get any kind of return from giving you money. So they might think well, they're better off paying that $500 or $1,000, whatever, putting that money for Facebook ads or advertising through some other channels, alright? Or paying some influencer on Instagram who has 20,000 fans, alright? So you really need to get clear on what is the value that you're creating and offering to your buyer, and then, demonstrate that, back that up with numbers, good analytic numbers, you know, site visitors that your seeing, unique visitors per month and that kind of thing. So having said that, you may be able to start by exchanging because you need to build your audience first of all and get those numbers up. So you might do some interviews for free and list those profiles and not charge the artist because that's gonna help you actually start to build the content on your website, and also, that's gonna build organic SEO, search engine optimization value, which means your website can rank higher in Google for specific keywords or even the artists' names that you're gonna profile. So that's what I would recommend is first step is to actually do that. Put a bunch of content on the website, articles, profiles and that kind of thing, and once you get to like 50 to even 100 pieces of content, unique, then that's gonna help you build and track how much traffic you're getting. Now, a key part of this whole thing, for it to work, is you need to get a promotion strategy of how you're gonna share any content that's on the website out to draw more people back to the website, okay? So you need to factor that into your strategy, as well. And then, over time, you'll build a following. Then once you've got those numbers, then it makes sense to go to these artists and say, well, hey, I'm getting 2,000 to 5,000 or 10,000 unique visitors to my site every month. Would you like us to profile you? This is how much it's gonna cost, and we're gonna get you in front of this number of people potentially each month, okay? So that's my answer. Go ahead and put together a game plan. If you have any questions on this, out that in the comments. If you have any other questions not related to this question, that's cool, but around marketing and blogging, go ahead and put that in the comments, and I can answer that in the next video. Thank you. If you enjoyed this, subscribe to my newsletter to receive updates and share this with anyone that might enjoy it, as well. Anfernee Chansamooth out, and I'll see you next time. Glad I could help Deb! Keep me posted on your progress. The key is to have a clear strategy for your content (refer here for a guide- http://www.simplecreativemarketing.com/blog/content-strategy-effective/), then get into a regular publishing rhythm with getting articles/posts up on your site and promoting each piece of content. This will help your search engine rankings and audience building over time.